As she weighs another bid for the White House, Hillary Rodham Clinton said Thursday she has a "grandmother glow" that's fueling her campaign for female empowerment and gender equality around the world. Speaking to a national convention of female real estate professionals, the former secretary of state and potential 2016 Democratic presidential contender called on business and political leaders to close the gap in wages and leadership positions between men and women. 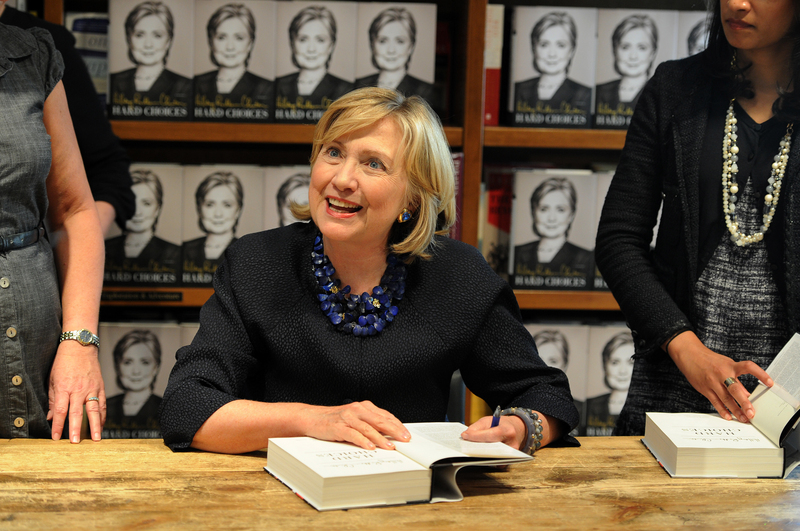 Will new grandma Hillary Clinton run for president in 2016? A woman in the audience complimented Clinton, telling her she looked "beautiful," and Clinton responded, "I think it is a grandmother glow." Clinton's first grandchild, Charlotte, was born to her daughter Chelsea and son-in law Marc Mezvinsky last Friday. During her speech, Clinton said she wanted all women to grow up in a world of "full participation and shared prosperity." "I think my granddaughter has just as much God-given potential as a boy who was born in that hospital on the same day," she said. "I just believe that. That's the way I was raised." Some have speculated that Clinton's granddaughter might make her more likely to launch a presidential bid. "Let's be serious. She is running for president," said Washington Post columnist Ruth Marcus Sunday on CBS News' "Face the Nation." "She does not want to be explaining to 10-year-old Charlotte that grandma could have been president but decided to stay home and change diapers." Drawing heavily on her own professional and personal experiences - including several references to her bruising presidential campaign in 2008 - Clinton said in her speech on Thursday that women face double standards in business and politics and that governments should work to enact policies that break down barriers to equal opportunity. The crowd offered several standing ovations in response. "These ceilings I'm describing don't just keep down women, they hold back entire economies and countries," she said, "because no country can truly thrive by denying the contributions of half of its people." It's a familiar message for Clinton, who's repeatedly hit those themes as she travels the campaign trail to help Democrats in the midterm elections. On Thursday, she said the U.S. should eliminate what she called the "motherhood penalty" by requiring paid leave for new mothers. The measure, she said, would pave the way for more women to participate in the workforce. "Laws matter," Clinton said. "I believe 100 percent in women being able to make responsible choices, but it's hardly a choice if you're working at a low-wage job, you get no leave and you can't even afford to bond with your baby because you have to get back to work." Though Clinton's 2008 presidential bid downplayed talk of gender politics, many expect Clinton to lean more heavily on a message of women's empowerment if she runs again in 2016. She's frequently invoked former first lady Eleanor Roosevelt's quip that women in public life need to have "skin as thick as the hide of a rhinoceros" in public appearances, and she's dwelt at length on the double standards faced by men and women in the professional world. Clinton was also in South Florida to promote her book about her tenure as the nation's top diplomat and to help Democrat Charlie Crist raise money for his gubernatorial campaign. Crist, a former Republican governor, is locked in a tight race with Repubican Gov. Rick Scott, who has outspent the Democratic nominee by a 2-1 margin in television advertising. The two are currently neck and neck in public polling - Scott was up 46 to 44 percent in a Quinnipiac poll released in September, but other recent surveys have shown the Democrat ahead. Clinton has said she expects to make a decision on a White House bid by the beginning of next year. The appearances help increase her exposure to voters in the nation's largest swing-voting state and allow her to reconnect with some of the same big-money donors who supported her and her husband's past political campaigns. Polls have shown Clinton dominating the Democratic primary if she decides to run. They've also shown her in a competitive position against many of her prospective Republican challengers.